The flag is red over (dark) green, with the emblem in dark yellow. 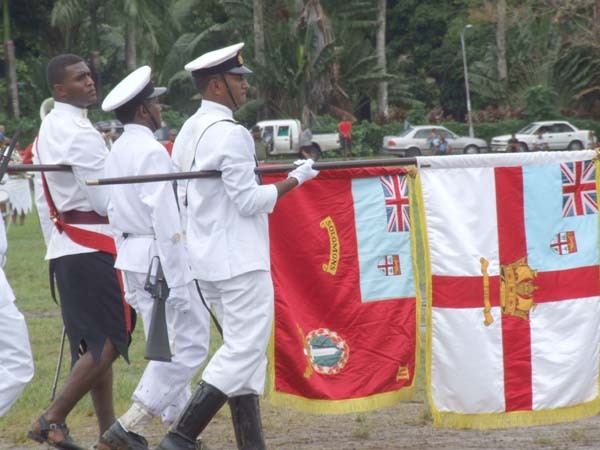 These are almost certainly the ceremonial colours of the Republic of Fiji Military Forces: the red one on the left is the Colour of the 3rd Battalion, Fiji Infantry Regiment; the white one with red St. George's Cross on the right is the Colour of the Naval Unit. 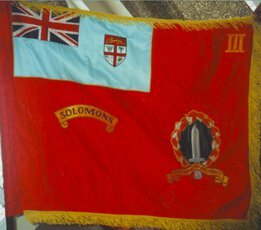 The 3rd Fiji Infantry Regiment Presidential Colour is a square red flag, in the canton, the Fijian national flag, in the upper part of the fly, the gold cypher III, in the lower part of the fly, the badge of the Regiment in colour, and beneath the national flag, a gold scroll bearing the word “Solomons” reference to the Second World War. Cochrane & Elliott (1998) report a national flag as fin flash as the only marking of the Air Wing, Republic of Fiji Military Forces. However, it is reported at http://orbat.com/site/air_orbats/orbats/FijiMilitaryForcesAirWing.pdf that "Formed in 1978, the Air Wing ceased to exist when it sold its last helicopter in 1997. Fiji Air Wing AS355F-2 DQ-FGH was originally purchased by the Fiji Air Wing as the country's only (semi) military aircraft. However, it seems to have spent most of its time in Fiji being operated on commercial flights by Island Hoppers. It was later sold in France in mid-1999.